Elise was diagnosed with type 1 diabetes (T1D) in 2008, two days after her first birthday. Team Elise started three weeks later when we participated in the JDRF Walk in Dallas. Elise is now 11 years old. In the last ten years, we have had over 1,900 people walking for Team Elise in Dallas, Toronto, Lisbon, Maputo, Little Rock, Abu Dhabi and New York City and we have raised over $135,000 for JDRF! T1D is an autoimmune disease in which a person’s pancreas stops producing insulin, a hormone that enables people to get energy from food. It occurs when the body’s immune system attacks and destroys the insulin-producing cells in the pancreas, called beta cells. While its causes are not yet entirely understood, scientists believe that both genetic factors and environmental triggers are involved. Its onset has nothing to do with diet or lifestyle. There is nothing you can do to prevent T1D, and — at present — nothing you can do to get rid of it. Elise is now in fifth grade in the dual language and gifted and talented programs. 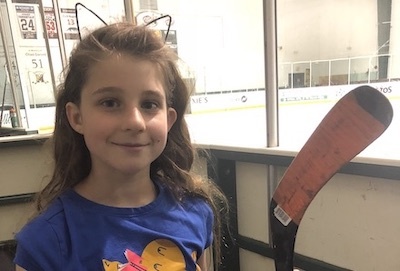 She loves to play hockey and soccer, read, play outside with friends and family, write stories and play the cello. Elise has also published two books. You can get her latest book - A Gingerbread Wonderland - at www.agingerbreadwonderland.com and her first book - The Mouse Who Ate The Moon - at www.themousewhoatethemoon.com (the Portuguese version is available at www.oratoquecomeualua.com). It has been ten years since Elise was diagnosed. T1D is tough, especially when you're a kid. Every day, Elise gets her fingers poked 5 to 10 times, sometimes more. She had at least three shots a day for over three years. In November of 2011, she started using an insulin pump (Omnipod) which means that she only gets shots if we run into an issue with the pump, which now delivers her insulin. The pump has to be changed every three days. We have to figure out the amount of carbs so that we can give her the right amount of insulin to cover the carbs that she eats. T1D is a 24/7/365 disease. Not only do we check her blood sugar during the day, we also get up at least once a night at around 3 AM to check her blood sugar and give her carbs or insulin, if needed. Elise also has a continuous glucose monitor (Dexcom) so that we can know what her blood sugar is at all times and if it's stable, going up or down and how fast it's rising or dropping. In 2014, Elise was the youngest kid, at age 6, to enroll in a clinical trial for the bionic pancreas, a system that uses a continuous glucose monitor and an insulin pump to deliver both rapid-acting insulin and glucagon as directed by a computer algorithm. Check out www.deathofapancreas.com where Joanne blogs about Elise and T1D. JDRF is the leading global organization funding T1D research. Their mission is to accelerate life-changing breakthroughs to cure, prevent and treat T1D and its complications. To accomplish this, JDRF has invested more than $2 billion in research funding since their inception. They are an organization built on a grassroots model of people connecting in their local communities, collaborating regionally for efficiency and broader fundraising impact, and uniting on a national stage to pool resources, passion, and energy. They collaborate with academic institutions, policymakers, and corporate and industry partners to develop and deliver a pipeline of innovative therapies to people living with T1D. Their staff and volunteers throughout the United States and their six international affiliates are dedicated to advocacy, community engagement and their vision of a world without T1D. Our goal is to create awareness about T1D and raise money to cure, treat and prevent T1D. If you would like to become a Team Elise sponsor, go to the Sponsors page to view the sponsorship packages available and email info@teamelise.com for more information. A big thank-you to everyone who has supported us over the years. It means a lot to us! Copyright © 2018 Team Elise. All rights reserved.